In installed Norton Security on my Mac Book Pro in November. On December 20th, I noticed that my battery was running out very quickly and then noticed that the CPU was maxed out. Activity Monitor indicated that the culprit was SYMQUALD. Further research indicated that this was part of the Norton Security software, which up until now had been running just fine. This problem continued for several days, even after reboots. Other blogs indicated that the only resolution was to uninstall Norton. So, I finally uninstalled Norton on Jan 1. Today, Jan 8, I reinstalled Norton Security, hoping that an update to the software had fixed the problem. Unfortunately, SYMQUALD began maxing out CPU again. So, I contacted the Norton Support and they spent 90 minutes going through various things, such as uninstalling and reinstalling Norton Security, running the Apple disk utility on my Mac (which showed no errors). I am now waiting for Level 2 support to call me back tomorrow night when I have more time to go through this with them. Let me know if you are also having this problem. Hello James. By any chance are you running an SSD as your primary boot drive? What version OSX are you using? Hi SoulAsylum. Yes, I am using an SSD and running the latest version of OSX (10.13.2). I don't know for sure, but it seems that the problem happened after the most recent OSX update. The level 2 support uninstalled, cleaned out old Norton files, and reinstalled Norton. Then, when the problem recurred, he captured some log files and is analyzing the data now. He says that symquald is responsible for error reporting, so the log files should give us a clue. I also should have asked if the SSD is from Apple, pre-installed or a third party SSD. The reasoning is Apple SSD's will already have TRIM enabled by default whereas third party SSD's will not. Check your TRIM settings just to be absolutely sure. Trim enabled on some SSD's can cause serious issues alike having "fast boot" enabled on a Windows machine which supports it. Some systems never get a "clean and complete" shutdown. So if yours is 3rd party get some info from the manufacturer before making a decision either way to enable or disable. I have this same problem since upgrading to macOS 10.13.2 today. I do not have an SSD. I've uninstalled and reinstalled Norton Security and it did not help. What is the purpose of the symquald process? I don't think it is doing scanning, is it? The Level 2 support person that is working on my case says that symquald is responsible for collecting and sending information about errors back to Norton over the internet. I've been having a sporadic restart for awhile, just upgraded to 10.13.2 hoping that would fix things. Started looking at CPU utilization and found symquald maxing the CPU. Anyone with more information that might fix this? how about the progress with Norton Support? Did they fix it? If all good we can rule that one out. As an experiment, I just killed the symquald process (with Applications->Utilities->Activity Monitor). symquald did not restart as a CPU hog. And also did not CPU hog after reboots. I'm using the latest version of Norton Security for Mac downloaded directly off of the norton website. I am also running the latest version of macOS (10.13.2) running on a MacBook Pro 13" mid 2010 w/ 8GB of RAM and 500GB Samsung SSD. I along with another person posting to this support site feel that the problem started after the most recent macOS update. I'm still stuck on the TRIM aspect specifically trimforce but that shouldn't be an issue due to the SSD being the boot volume. James give the workaround NodalWorks performed and let us know how that worked out please. I will try that next, SoulAsylum. I've been running for a while without Norton installed, having removed it out of necessity because it killed my battery life. I've been waiting for Symantec to get back with me after they downloaded all the log files from my Mac, but so far its been radio silence. So, I'm reinstalling it tonight and will wait for symquald to max out again, then I'll force enable TRIM on the Samsung EVO 850 drive using the terminal command, sudo trimforce enable. I'll let you all know what happens. Can you verify that you actually killed the symquald process? I tried enabling TRIM on my Samsung EVO 850 SSD using the Terminal command, sudo trimforce enable. After reboot, my mac ran for about 5 minutes before getting a fatal error and shutting down. Obviously, after rebooting again, I disabled TRIM. I killed symquald using the Activity Monitor, forcing the thread to be killed. symquald disappears for a few seconds and then pops back up again, maxing out the cpu again. That post did not result in either of them getting a solution to the problem. On some post somewhere (can't find it again) someone indicated that the symquald process is there to report errors to Norton. That post indicated that there is some way to tell Norton to not do any error reporting. I can find instructions on Youtube for doing this on Windows, but not on a Mac. I tried setting "Error Management" to 'off' in the Product Settings in NortonSecurity app, but after a few minutes, it turns "Error management" back 'on'!! Does anyone know how to tell Norton not to run the error notification? Sorry, SoulAsyum. I missed this post of yours. I have turned off the Error Management and unchecked the 'enable detailed error collection'. Ive also rebooted after making these changes. However, every time I leave Norton and come back in, the Error Management is turned back on! And of course, symquald is still maxing out the cpu. James I will ask the admins and Norton to get involved. Please give it a little bit for something to post here if you would. This needs addressed and I am out of ideas unfortunately. Sorry for the inconvenience. I have just updated to the macOS High Sierra version 10.13.3 and immediately noticed that the Symquald maxes out CPU, it is running 380% constantly. I am using MacBook Pro (Retina, 13-inch, Early 2013); Processor 2.6 GHz Core i5; Norton Security. I'm using it for three days and the "symquald" has stopped loading the CPU. Be careful when using. This procedure requires a better understanding of the Mac system. I saw that workaround just a bit ago, thanks for posting it JAMC. An update: Level 3 support asked me to reinstall Symantec again, and then wait 24 hours. They then collected additional log files. They believe that some other app is crashing and this is related to symquald maxing out on the CPU. They are looking at the log files now. James, thanks for the follow-up. Still following the thread to see what the final solution is. When I rename that file as SymqaldX, the CPU usage returns to norma. This is, of course, a workaround until the correct fix is provided by Norton, as symquald provides an important function and I have now disabled it. Thanks for the work-around - I've had this problem and disabling symquald has stopped the madness. Has anyone heard anything from Symantec on this? It's been a month now since any update to this thread. No feedback from Norton at the present time to report. Good news collirob. Keep us informed please. symquald remained quite for this week, but I had a significant load from SymDaemon that was stuck at ~30% CPU. I thought it might be related to background scanning (Automatic Scans), so I tried turning that OFF in settings (initially no effect). But then the Norton warning messages started to come in and I decided to restart the Mac. When it rebooted, the autoscans were ON again and a "500+" % load from symquald was back. I'm getting close to punting Norton completely (after I get time for another backup, etc.) I think I'll go take our my frustration on the lawn. All: This user posted this comment in a thread I have asked to be moved here to the MAC board. Not sure it his solution will fix things you are seeing, never the less should be worth the efforts. Retired Unisys specific software engineer, "long live DMS and MCP", avid for solutions, impatient with poor performing code and comments like Steve's (former Microsoft CEO): " I'm not sure anyone can debug this stuff". Began programming in 1963. Big iron rules! 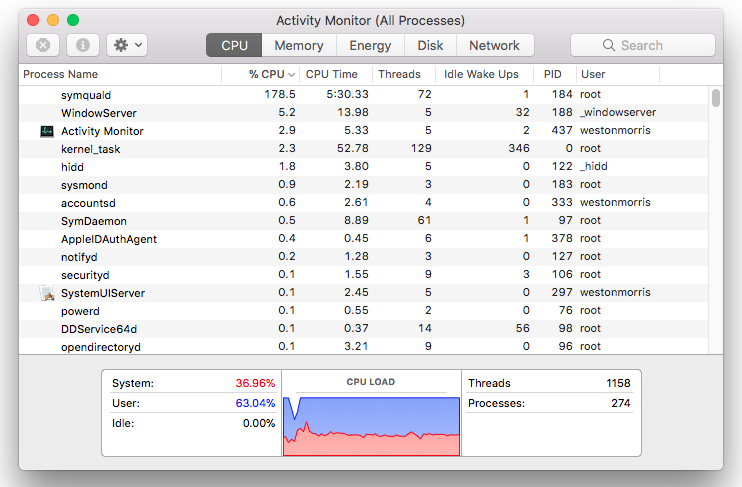 All: Following up to something I read earlier this evening about the Chrome Norton extension on MAC being the cause of SYMQUALD running high CPU usage, any of you in the thread using Chrome? Have you applied, as well as others here in the thread, this workaround discussed by jerb? Since doing that I have no longer had problems with symquald consuming all the cpu for hours on end. However, I don't consider this a proper fix as it disables Norton's ability to upload data back to Symantec. I may try the 7.7 update over the weekend to see if that works successfully. It looks like Norton 7.7 was installed on my machine on May 10, so I've been running with it for the last 6 days and have not had any problems with runaway CPU consumption! That is good news. It appears that the symquald problem has finally been fixed. Thanks to all on this forum who provided workarounds and suggestions. Hi all: i'm calling out james west as an appropriator of credit. I (Jerb) actually posted this get around first, and have Norton techs to support that. You're so lazy you even copied the X. Any freaking letter (or legal name character) would have worked. I guess small machines attract small minds. You sir are humbug. Lets get our facts straight before calling out someone. And lets please keep things civil at all expense. If you have not done so already please run live update to get the latest and reboot your systems. We would appreciate hearing from everyone with their status once you all have updated, to confirm the issue indeed has been addressed and corrected. Hi Jerb, My apologies. I acknowledged your research in my March 18 post. In my post yesterday, I was simply confirming that the workaround still worked. In my post yesterday, I should have reaffirmed that the workaround came from you. There was no intent to take credit for your good work. I am still on NS 7.7, so no changes have been made (by me) to my Mac. However, just like in the past, my CPU is maxed out and symquald is tagged as the culprit. Is anyone else seeing this problem rear its ugly head again? I will try Jerb's earlier tip to rename the symquald executable and reboot. Hello James. I'm following up on your status and if the workaround took care of the issue. Hi SoulAsylum. Yes, Jerb's workaround also works for version 7.7. It would be great if Symantec addressed the problem with a permanent fix, though. :) Thanks for checking. Thanks for the update James. Please note that I put this forward to the dev team some time ago for a solution. Stay tuned to the threads here, I am certain a fix will come. When is something we cannot predict.